Kochi: The Detailed Project Report (DPR) of the second phase development of Vyttila mobility hub is fast nearing completion with authorities focusing on world-class security features, hassle-free pedestrian flow, green spaces, which can serve as leisure spots for not only commuters but also residents, and commercial spaces for generating profit. The DPR would be finalized by November-end and the work is likely to begin in the next couple of months. Vyttila Mobility Hub Society (VMHS) is yet to decide whether it should be a public-private-partnership (PPP) or a project of VHMS. “It is up to VMHS to decide on the financial model for the second phase. Kochi Metro Rail Ltd (KMRL) is the implementing agency. 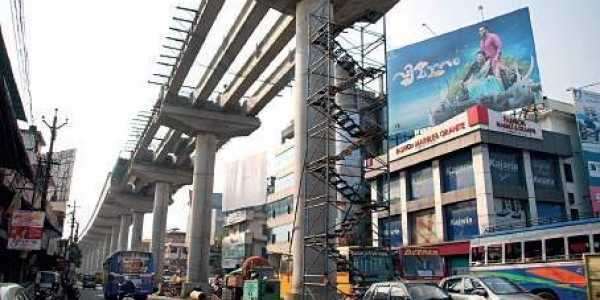 KMRL will complete the construction and hand it over to VMHS,” an official with KMRL said. Sources said VHMS wants to start its own project and seek financial aid from international funding agencies later. The consultants for the project have prepared three designs, which was selected, to enhance security and other features. “The first design was dropped as commuters would have to use staircases or elevators. The defect of the second one was that it had more intercepting points for vehicles and pedestrians,” sources with VHMS said. As per the selected design, the building will have two stories above the ground floor. “About 39% of the 24-acre area earmarked for the project would be retained as green space while 34% would be utilized for the terminal, which will have passenger amenities, the Metro station, water Metro jetty and space for commercial establishments. The ground floor would have terminal and passenger amenities while the first and second floors would be for commercial space,” sources said. The bus terminal would have two separate areas, one for city buses and the other for regional buses. There would be 16 bus bays for city buses. The area for regional buses will have 76 boarding bays and nine alighting bays. As many as 78 bus bays would be built for parking the buses. The multi-level car parking facility, to be set up at the mobility hub, would be able to accommodate 700 vehicles. Lots will be made available to park 456 motorcycles and 50 autorickshaws as well. Dormitories for passengers, petrol bunks and CNG outlets, effluent treatment plant and rainwater harvesting facilities are some other proposed features of the hub. Meanwhile, the government has appointed urban affairs director R Girija as the new managing director of VMHS. She will assume office on Friday. District collector K Mohammed Y Safirulla has been holding the charge of MD so far.